Sri Lanka Malay is a variety of Malay which has undergone heavy in.uence from its adstrates Sinhala and Tamil since the .rst Malay immigrants arrived in Ceylon in the 17th century. While the lexicon is overwhelmingly Malay, the grammar has diverged considerably from its Austronesian origins and become solidly South Asian. 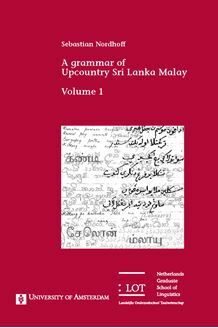 Where other Malay varieties are morphologically isolating and have prepositions, postposed modifers and verb-medial word order, Sri Lanka Malay is agglutinative and has postpositions, preposed modifiers and verb-final word order. These changes all happened within the last 350 years. Sri Lanka Malay is therefore a very important language for scholars of language contact and (rapid) language change. This grammar describes the sociohistorical circumstances in which this language developed and gives a full overview of its phonology, morphology, syntax and pragmatics, which makes it a useful resource for Austronesianists. Similarities to the contact languages Sinhala and Tamil are highlighted to incorporate the South Asianist’s perspective. Besides the traditional form to function description (what does morpheme X do? ), this description also covers the converse perspective, i.e. function-to-form (How can function Y be expressed in the language?). This makes this book also a valuable resource for typologists, syntacticians and semanticists.